These any size fingerless crochet gloves are a match for my any size hat and scrap cowl, set. The gloves crochet up quick and easy and can be crocheted up for adults, teens, and even young children. You basically start off with any multiple of two in order to get the correct circumference. Then for the thumb, it naturally creates a large thumb opening, which you can adjust in size by the number of stitches that you crochet along that edge. My favorite thing about these gloves is the texture of the fabric. Instead of a ribbed edge over the wrist I added a beaded row in a different color. I made mine short, but you could easily increase them to cover the arm as well. 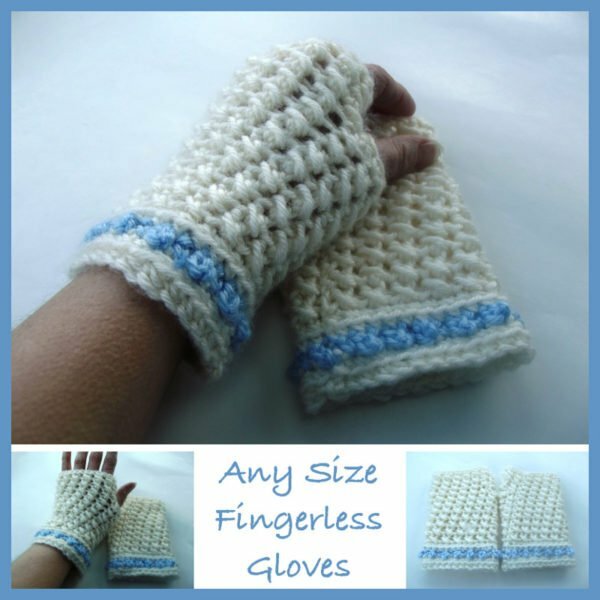 You might also want to check out this roundup, or visit the main category for more fingerless gloves crochet patterns. Yarn: Caron Simply Soft or any yarn you have on hand. Crochet Hook: I/9-5.50mm or any hook suitable for yarn. Gauge: Measures 4″ over 14 hdc sts and 10 rounds. Finished Size: When laying flat they measure just under 4″ wide and 5.5″ high. Bead St: Insert hk into indicated st, yo and pull through, (yo and pull through one lp on hk) twice, yo and pull through both lps on hk. When you work into the next stitch make sure the bobble is facing the right side. Carry CA up when you switch to CB in rnd 3. With CA, Ch 26 (or any multiple of 2 to get circumference needed), join with sl st in first ch being careful not to twist chs. Rnd 2: Working into bls only, ch 1, sc in same st as join and into each st around; With CB, join with sl st in first sc. Rnd 3: With CB and working into both lps, ch 1, work bead st in same st as join, sc in next st, *bead st in next st, sc in next st; rep from * around; With CA, join with sl st in first bead st.. FO CB. Rnd 4: With CA and working in both lps, ch 1, sc in same st as join and into each st around; join with sl st in first sc. Rnd 5: Working into bls only, ch 1, sc in same st as join and into each st around; join with sl st in first sc. Rnd 6: Working into both lps, ch 1, sk the first st, hdc in next st, hdc in skipped st, *sk next st, hdc in next st, hdc in skipped st; rep from * around; join with sl st in first hdc. Rnds 7-12: Same as rnd 6. Rnd 13 (Thumb-opening Rnd): Working into both lps, ch 1, sk the first st, hdc in next st, hdc in skipped st, ch 4, sk next 4 sts, *sk next st, hdc in next st, hdc in skipped st; rep from * around; join with sl st in first hdc. Note: If you need a larger thumb opening, increase your chs in multiples of two. Then skip the corresponding amount of sts below. Rnds 14-16: Same as rnd 6, counting the chains from 13 as sts. Rnd 17: Ch 1, working in both loops, sc in same st as join and in each st around; join with sl st in first sc. FO. Thumb-opening Edging: Join CA to thumb opening and work 10 sc evenly around; join with sl st in first sc. FO. If you need a larger thumb opening, work 12 sc evenly around. Hello:I´m from Uruguay but now I live in Brazil and love crochet,I liked very much your fingerless gloves but i don´t understand how to crochet the bead stich.can you indicate a video instructions to make it? Excuse my inglish,Thank you!! !